One of my great Twitter friends is Cyra DuQuella. Cyra's a Portland, OR based tile artist who's spent her career rediscovering the lost art of tubelined tile. Tubelined tile is a technically demanding method of decorating tile. The relief patterns you see on the tiles in this post are examples of that tubelining. DuQuella tile isn't cast in a mold, each piece is hand done. 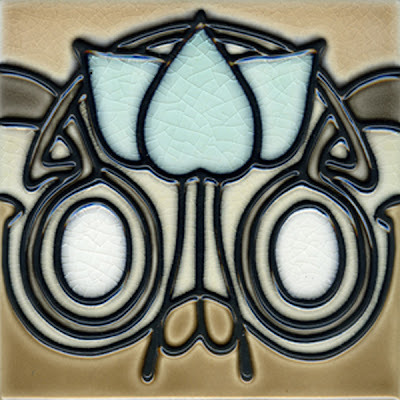 DuQuella Tile has an extensive catalog and lives for custom projects. Cyra's an amazing woman and anybody who's willing to dedicate her life to learning and mastering a lost art is OK in my book. I sent a couple of questions to Cyra and her answers follow. If you have any questions about her work or her company, ask away in the comments and she'll get back to you. 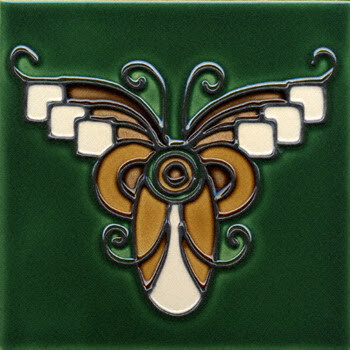 The DuQuella Tile website is a terrific resource and I encourage you to follow DuQuella Tile on Twitter. What is your background, how did you end up in tile? In my early 20s I found myself unemployed and bored and decided to take a pottery class at the YWCA. I was hooked immediately. Quite a few years later I was traveling in Europe and saw tubelined tile and was mystified by the beauty and technique. The business woman in me came to grips with that people call up and order thousands of dollars of tile but rarely do so for serving platters and sushi plates. So off into the tile world I go! Are there any influences you rely on particularly? I've never really been much for trends. 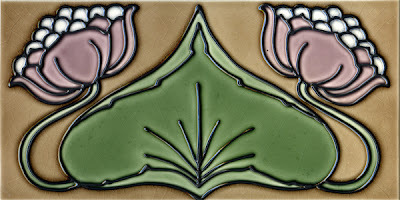 I am in love with historical tile - especially European Arts & Crafts and Art Nouveau. The classic designs, the craftsmanship, the methods. Also Japonica aesthetics, designs and patterns. How long have you been making DuQuella Tile? 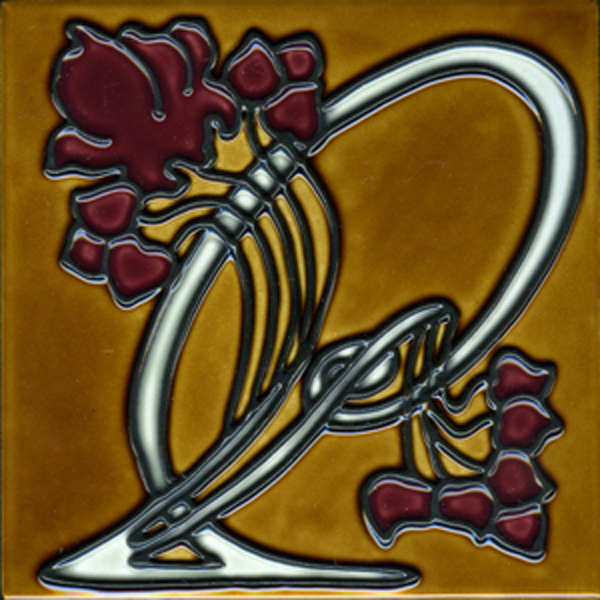 I have been a potter for forever it seems but I put most of my focus on making tile beginning in 1996. Before tile became trendy. What's your proudest achievement? Why? Maybe thankful is a better word. I am thankful that I am able to do what I love every day. I get to create tile that I love and send them off to their new homes where they are truly cherished for their beauty and quality. Our clients are overjoyed by their selection and feel that their lives and homes are enhanced by something that we have put our creative energies and our craftsmanship skill into. I am proud that I figured out how to make tubelined tile. Worldwide, there are very few of us creating tile using this method. I was determined to make the tile true to the historical method although the inherent properties of clay make it seem impossible. 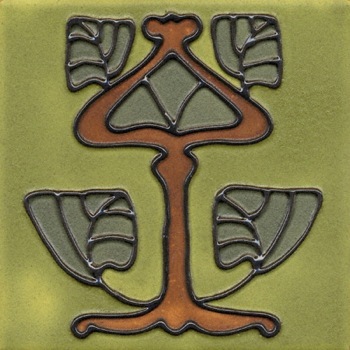 The original method involved drawing a wet clay line onto a blank tile that had already been fired once (bisque). As wet clay dries, it shrinks --but a bisque tile doesn't. I had to come up with a clay mixture that wouldn't shrink or crack when it dried and that would melt into the bisque tile enough to become an integral part of the finished tile without distorting the perfectly round shape of the tubed line. Alchemy at best! It would have been much easier to slip trail the raised line on wet clay, made a mold of it, and press out a million of them and call it a day (or a tubelined tile, as some tilemakers do). But that was not my endeavor. When I moved here from central Washington --the cultural void of the universe, I lived at the beach for 6 years. I was so attracted to the lush green, the pristine beaches and the individualistic, liberal attitude of the people. When you're not immersed in beautiful tile, how do you spend your free time? There is not much free time for sure. There is always marketing, design brainstorming, website work and the dreaded paperwork. I am a much better artist than I am a paper shuffler. I love to spend time on our property, CedarBerry Woods, in the central Oregon Coast Range. (3 hours from our home here in Portland) We have 12 acres of forest with a creek that the Coho salmon come to spawn every fall. We are doing riparian restoration, planting trees (Douglas Fir, Western Red Cedar, Hemlock and Coast Redwood) along the creek. I still have about 50 trees in pots ranging from 3' to 8' in my back yard waiting to go to their new home. I am a vintage book collector (10,000+) and love to read. I've had to curtail collecting as my house is too full! Spending time in my garden. We have no lawn - just plants and plants everywhere. For edibles we have fruit trees and loads of raspberries, marionberries, strawberries, kiwi and the usual assortment of vegetables. Everything is organic. I have a bunch of cats and 2 dogs --all rescues that are endless entertainment and cuddlebugs and lovesponges. A very special treat is to spend time with my daughter who is an amazing artist in her own right. We both have crazy, deadline-driven schedules so having time to relax together is treasured. Out of all the patterns and projects you work on, which is (are) your favorite(s)? This has got to be the hardest question. Patterns --I love the flowing lines of the whiplashes of the Art Nouveau tile... and the earthiness of the Arts & Crafts tile... and the modern, futuristic edge of the Art Deco patterns. Projects --I love when we are involved working up the layout and provide the field or subway as well as the decorative tile. 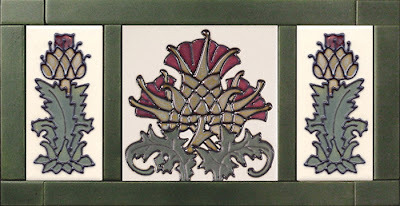 Or when we have to come up with a design to go with the existing stained glass window in the room. I love working with the client who doesn't have a big budget but still wants those few pieces of really special tile to transform their space. One of our favorite clients is [a man named] Lamar. 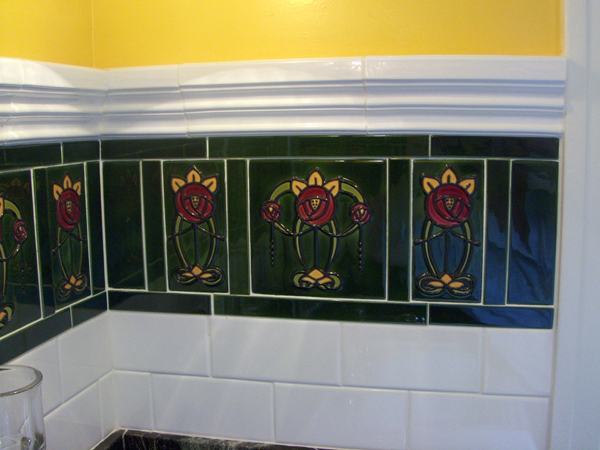 We created a spectacular border comprised of multiple tiles for his bathroom. When he received his tile he called and left a voice mail and he was practically squealing with delight! I still have it saved and listen to it after a particularly long and grueling day! That's my favorite kind of project --when the client opens the box and it's like Christmas! Do you work in media other than tile either on your own or professionally? I was a graphic designer for several years before disbanding my firm to devote full-time to tile. I used to design and make my own clothes. (Now I live in studio grubbies!) I've done sculpting in plaster and have created several series of silkscreened artworks. I've worked mostly in clay --originally with wheel-thrown, functional stoneware. Progressing to include a line of tableware created using found objects (mostly vintage) for slump and hump molding with textures and patterns using anaglypta papers, vintage buttons and stamps that I designed. I currently make jewelry that I market on Etsy. 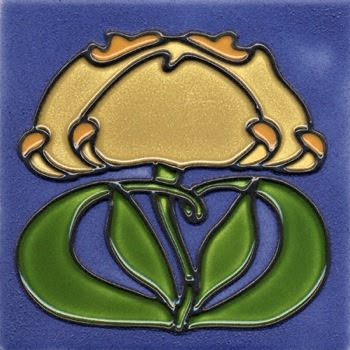 Someone who wants tile that is beautiful, finely made, unique and in the perfect glaze colors and size for their specific project. We work with homeowners who may just want a few focal points in their kitchen backsplashes or have a fireplace surround whose measurements could at best be called asymmetrical. We provide support, problem solving and hand holding for those who don't know where to start with working with tile. We also work with seasoned (and not-so-seasoned) designers making their job easier by providing custom (not expensive) solutions in a one-size/color-fits-all world. Where do you see DuQuella going from here? Most importantly, moving the studio to CedarBerry Woods. My soul screams every day to hurry up and get there. There is so much yet to be done before we could live there. We (well, at least me) are also considering opening our land to artists and nature lovers to provide workshops and much needed respites from the vibration and chaos of life. Always developing and experimenting with new designs and colors. Continuing to emphasize craftsmanship and advancing the appreciation of old world methods and historical designs. We have in the works some new relief tile which is a definite departure from our tubelined tile. We're working on a collection of crackle glazes. I am making a new line of textured and patterned tile with an Asian influence. We are making a new website as a companion to our current website. The new website is more about tile ideas and examples of how to use our tile while our current website will be our online catalog. As I get a little older I've come to greatly appreciate the artisans that are keeping some 'lost arts' alive. Stunning! Paul, thanks so much for your great post about DuQuella Tile. Your love of tile is contagious! Really beautuful tile and it makes me very happy to see that someone here in this country is keeping this tradtition alive. On my recent trip to Paris there was an Arts and Crafts Exhibit at the Musee D'Orsay and my favorite new old building was an Arts and Crafts building. That style really speaks to the artist and seeing these tiles has made my day. Bob, thank for your wonderful comments about our tile. I'm jealous of your travels. European tile are what got me started on this journey of tubelined tile! 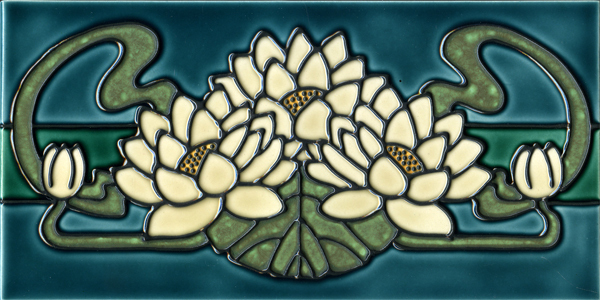 Cyra, I was so pleased to read this post about you and your tile is absolutely gorgeous. When I was a design student at UO (almost 20 years ago), we took a field trip to Pratt & Larson in Portland and I was amazed at the beautiful hand made tiles. We toured the factory and saw a little about the process. I am so impressed that you have created this amazing body of work and appreciate that you have (almost single-handedly) revived this process. Even more so, that it is in the Art Nouveau style that I love. My favorite design style is and always has been Arts & Crafts. Best of all, you are an Oregon country girl (like me). I grew up near Roseburg on a sheep ranch and made money painting and selling my work when I was younger. This lead to an education in design and a career that I love. I feel like I've found a kindred spirit! Good luck with the move to CedarBerry Woods. I am envious of your location. The Oregon central coast is so picturesque! I spent a Christmas holiday a couple of years ago with my daughter's family at Ken Keasey's family vacation home near Florence. Looking forward to seeing your website. Maybe someday I'll be able to commission some tile work. Wonderful work. I love seeing a true artist flourish. What a joy to make a living doing something you love. Thank for your thoughtful comments! .....and the Oregon love! CedarBerry Woods is about 35 mi. NE of Florence (10 mi N of Deadwood) amidst the Suislaw N. Forest. We love the moss & ferns & old growth. The peace & silence. Love the mention of Ken Keasey - we are near the Alpha Farm commune. Pratt & Larson have a great factory & showroom & tile. They were interested in our tile line but we prefer to remain independent and deal directly with our clients. 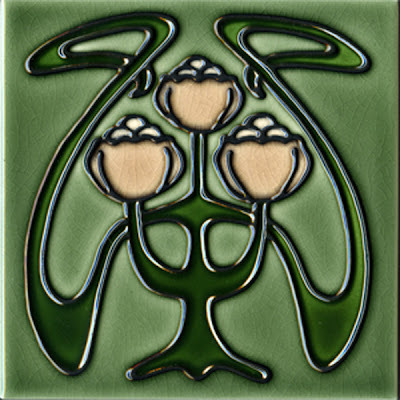 We'd love to work with you on a tile project. 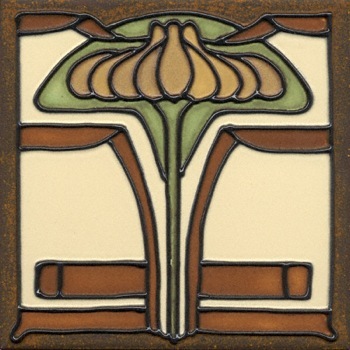 Tubelining works well for Art Nouveau, Arts & Crafts and Art Deco styles. 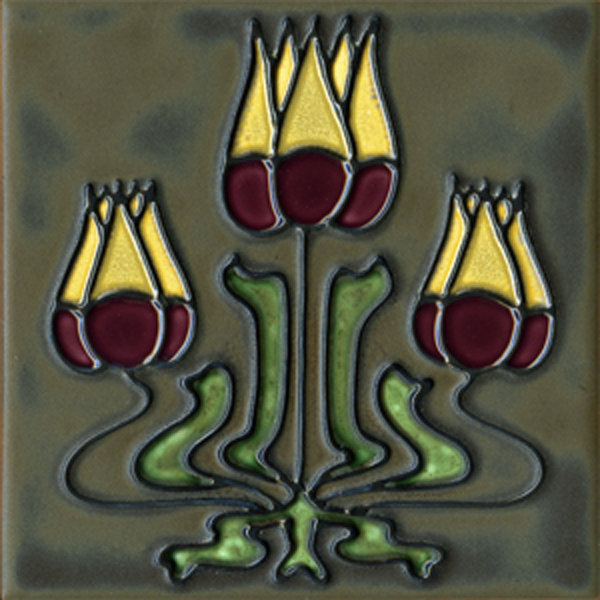 Sue, thank you for enjoying our passion for tile and our work! Delightful post about and equally delightful person, Cyra, who is passionate about her art and doing what she loves. And, boy does it show! 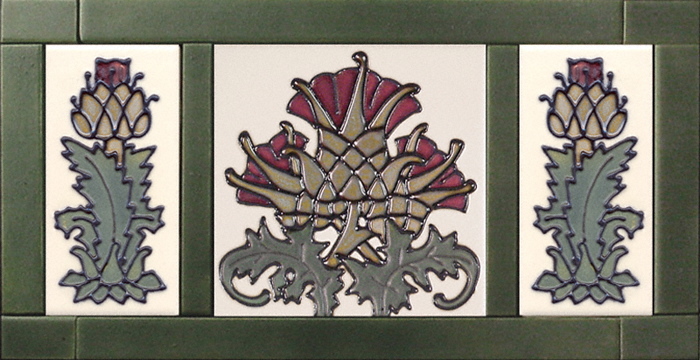 Each handcrafted tile is an exquisite piece of art. Tubelined tiles are a true labor of love and I'm glad you took the time to explain this unique and rare process, Paul! Thank you so much for featuring this great artist. Cyra was a thrill to work with from the very first interchange of e-mails. She was able to grasp my concept and gave me tiles that were more beautiful than I had imagined. Every morning I relish in the glow of my bathroom. My friends tell me that they are two of the most beautiful rooms they have seen. When one of my buddies takes a shower, I cannot get him out!!! I am now working on a design for the next space where I can use her tiles. To have such beauty in my home just brings a smile to my face each time I look at it. Cyra, once again, thank you for all of your hard work and inspiration. I think I'd have to be dragged from your bathroom too! This is what happens when I go on vacation -- I miss great posts like these. Just now getting caught up! Cyra- Portland, OR, like me! 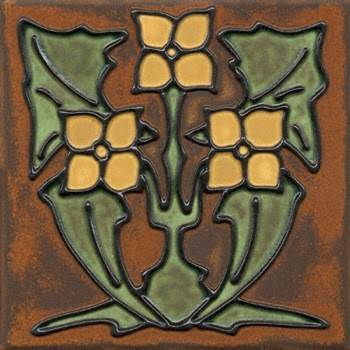 A current client of mine wants "cool arts and crafts tile" for her hearth backsplash so clearly, Cyra, we will be calling you! (we're several months out from that point.) I just sent her your website this morning. DuQuella is Cyra's last name. Sorry if I didn't make that clear. But how terrific that you have a potential client for DuQuella. You and Cyra will work together really well. You made it clear (first sentence!). I am just in skimming catch-up mode after vacation. Sorry! Thanks for the lovely comments. You are a delight to work with and I can hardly wait till your next project! Excited to hear that you have a client for our tile! I look forward to working with you!